Work Party: Welcoming The New York Harbor School! The BROWN has always enjoyed their interactions with the Harbor School students .We always seem to have great youth groups who are highly motivated and have high work ethics and this group is NO exception. If you missed our first blog, check it out HERE! JWB Volunteer Mike taught a number of students how to maintain valves. 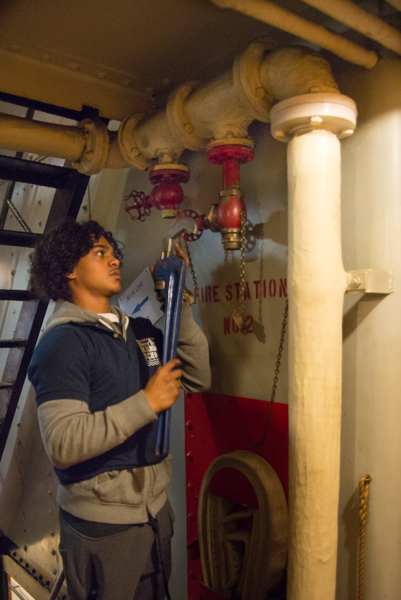 Students were tasked with finding fire stations throughout the ship and removing parts for regular maintenance, which they had the opportunity to conduct under supervision. Practicing newly acquired skills in the pipe shop and throughout the ship's interior spaces. Joe, our Chief Steward (aka. the most important man on the ship), had lots of help in the galley. With twenty teenagers and four adult chaperones added to our working crew this weekend, it really made a difference! We regularly inspect all of our life jackets. Once they reach the end of their service life they are replaced. The students swept and mopped the floor, set up the tables, and then moved the life jackets from their racks to the tables. A panoramic view of #1 tween deck with the lifejackets that are being replaced this year. A long way down! Crew and students join together to carry buckets of our unused rivets from the shipyard from the main deck down all the way to #5 lower hold. The structure you see in this picture is actually the propeller shaft alley. Coffee Break! 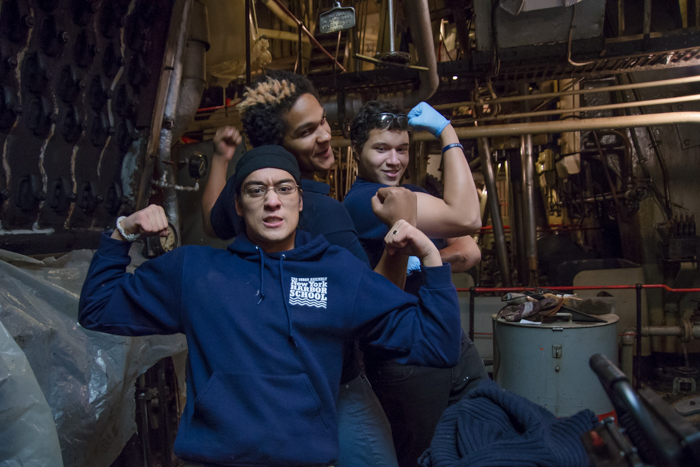 Students join the crew on the mess deck for coffee (and hot chocolate). Cargo Operations: The crew has recently undertaken a project to restore this historic artillery piece, a Bethlehem Steel 37mm Gun. Like the BROWN, these guns were produced at Bethlehem Steel in Baltimore, and were produced between 1916-1917. This was a great opportunity for the students to see active cargo operations aboard a merchant vessel, observing from all angles including right alongside the winch operators! Students observing how the process will go and the rigging of the ship. Crew members rig straps to lift the gun while keeping it perfectly level. The lift continues. The winch operators follow the signals of the rigger while the load is out of sight. Clear the deck! The load is about to be pulled across the deck and be set on the cargo hatch. Once the winch operators can see the load, they take over until the 99 year old gun is almost in place. Steadying the gun and turning it to orient it properly on the hatch. 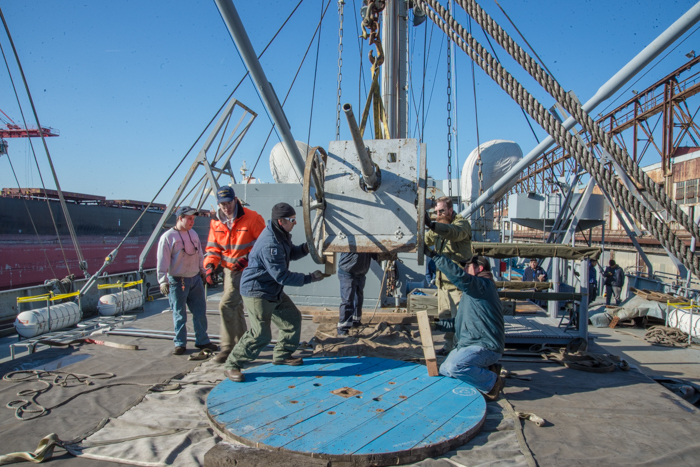 The delicate and precise process of setting the gun down on jack stands and a platform so it can be restored: This is where the experience of the winch operators, riggers and crew really show! Laying down on the job? OR Testing our the Pipe Berths. The BROWN has, for the past 25 years, been collecting and receiving donations of historical texts, blueprints, novels, personal memoirs, training manuals, etc. Beginning last year crew have begun the first comprehensive inventory and digital catalog of all of the items in the Library and around the ship. Upon completion, this space will become a real research library for use by PLS Members. Look for followup posts on this project as time goes on! Students pose for a shot in the library after unloading dozens of boxes of books and old uniforms from the library annex. They also got to enjoy the opportunity to look through historical items in the annex, including a complete collection of LIFE magazines from as far back as 1938, training manuals and history books from the 1940's, and even a complete set of flash cards from the BROWN's School Ship years. Photographs and wartime propaganda posters were a big hit, allowing the students to see how marketing has changed over the last eight decades, and get a glimpse of what life was like before and during the war years. Looking into the Historical Library from the passageway, you can see most of two of the bulkheads, newly rebuilt by our volunteers. Students were able to visit the MARK MORAN, one of several tugs just up the street from the BROWN. Mark H., BROWN volunteer and AB on the MARK MORAN gave a tour of the tug and is seen here explaining how tractor tugs operate. 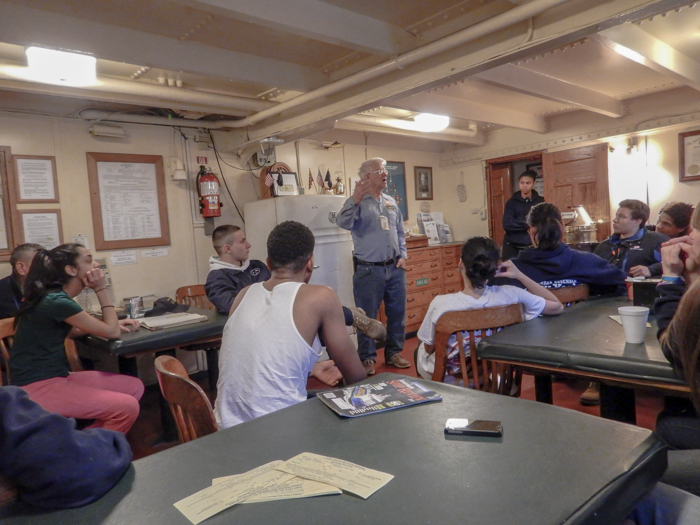 Students also spoke with the captain and crew of the MARK MORAN. Everyone was impressed by the students' intelligent and practical questions. On Sunday the students took the lead and loaded a binnacle built by one of our crew members. They brought it on board and moved it to the aft gun deck, the ship's emergency steering station. 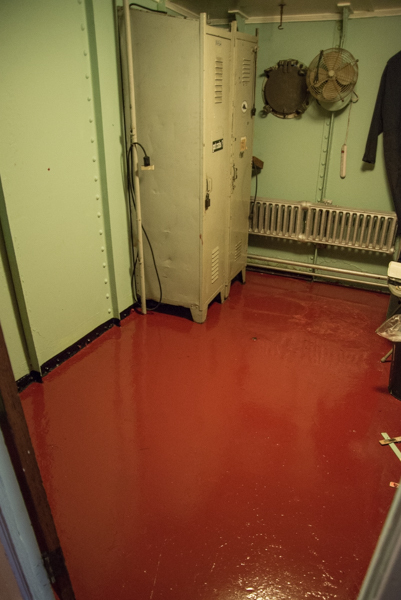 Before And After: Students prep the deck for paint in a bunk room. Before And After: The students' finished work. Students and crew clear out storage spaces for routine cleaning and in some cases changing out items on display. A number of students jumped a the chance to work with our engineers on our winter maintenance projects. Morning muster: Bill is the BROWN's Harbor School liaison. In addition to being a member of the Deck Department, he is an active member of the School Ship Alumni Association. The New York Harbor School was a fantastic group of kids and adults, and we were very impressed as always. The crew got a ton of work done, planning new exhibits, inventorying, and moving forward on restoration and maintenance projects. We are all excited for upcoming events this year, and can't wait to share them all with you here! Follow us on Facebook for news and events, and check back in HERE for your weekly blog updates! Older PostWelcome Aboard! Living on the BROWN in Shipyard.